UNIST has taken a major step toward laying the technical groundwork for developing next-generation high-intensity accelerators by providing a new advanced theoretical tool for the design and analysis of complex beam lines with strong coupling. The research results achieved by Professor Moses Chung of Natural Science at UNIST in collaboration with the Princeton Plasma Physics Laboratory (PPPL) of United States and the Helmholtz Centre for Heavy Ion Research GmbH (GSI) of Germany was published in the November issue of the prestigious journal, Physical Review Letters. Accelerators are devices that accelerate the movement of atomic-sized particles, such as electrons, protons, and ions to very high energies. They produce prompt radiation by accelerating atoms or their subatomic particles, which strike other target atoms. This striking effect of an accelerator is, then, used to examine the physics deals with natural law, including the study of nuclear structure. The next-generation high power accelerators, on the other hand, refer to accelators for high intensities and high energies. The high-intensity beams, generated by high power accelerators not only has the potential to reduce the half-life of a radioactive substance, but can be also used to produce best candidate materials for fusion reactors. High power accelerators get the energy they need by accelerating particles of the same charge. Increasing the beam current results in a repulsive force between charged particles and this has a strong influence on the path of the entire beam particles, which is known as “Space Charge Effect“. Current versus particle momentum for high-power proton accelerators around the world. In 1959, two Russian physicists came up with a theory using Space Charge Effect. However, this theory excluded the phenomena, involving the vertical and horizontal motion of particle incorporation. This has made it even more difficult to design and develop a new type of high power accelerators. 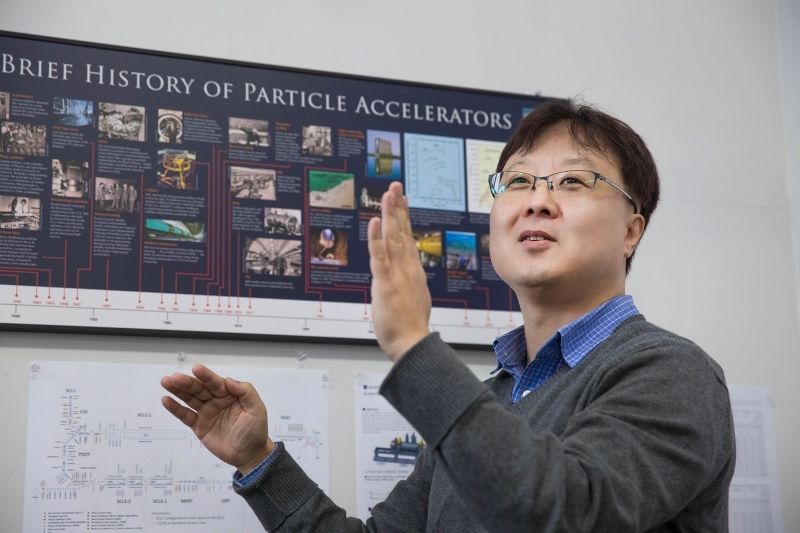 In the study, Professor Chung and his team proposed a new beam physics theory, addressing the vertical and horizontal motion of particle incorporation. “This theory provides important new theoretical tools for the detailed design and analysis of high-intensity beam manipulations, for which previous theoretical models are not easily applicable,” Professor Chung says. 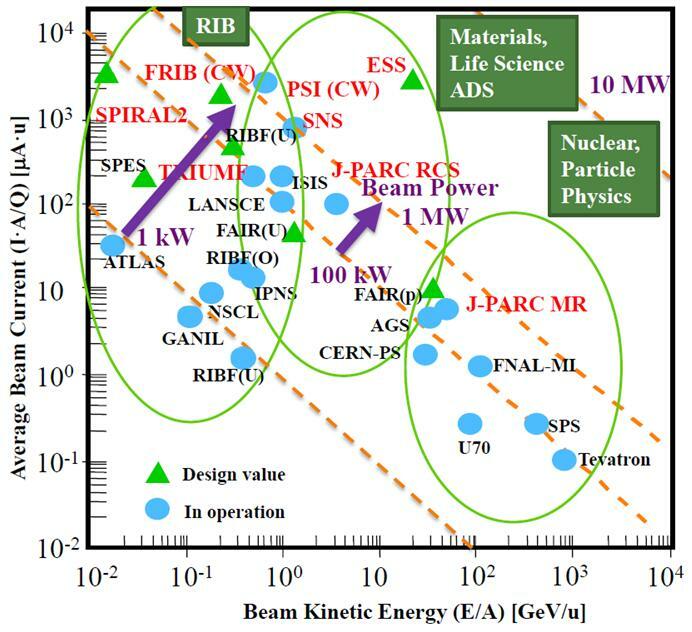 “The development of next-generation high power accelerators can greatly contribute to the fusion reactor materials research, the nuclear waste management, the study on the origin of the universe, as well as the optimization of the performance of existing accelerators. The study has been supported by the Science Research Center (SRC) Support Project and the Individual Basic Science & Engineering Research Project through the National Research Foundation of Korea. Moses Chung, Hong Qin, Ronald C. Davidson, Lars Groening, and Chen Xiao, “Generalized Kapchinskij-Vladimirskij Distribution and Beam Matrix for Phase-Space Manipulations of High-Intensity Beams”, Phys. Rev. Lett., 117, (2016).